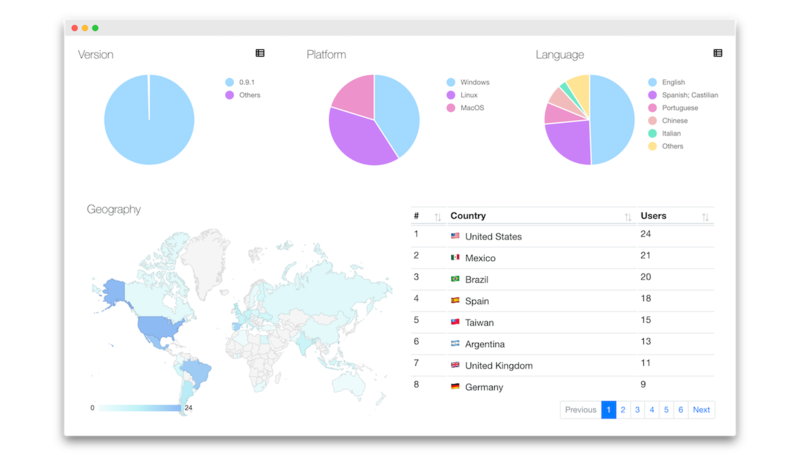 Real-time analytics, bug reports and events tracking with offline support for Electron apps. As simple as including a module. Visit the docs for more information on the module. How can Nucleus help you? Gather data on who is using your app and how, using custom events. 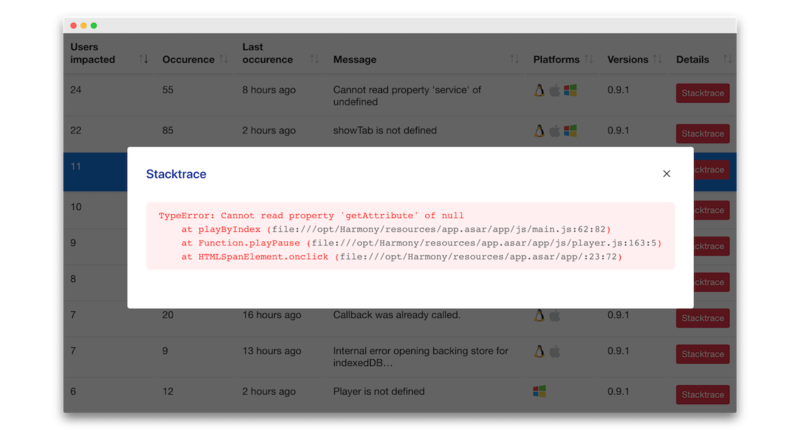 Collect errors and crashes occuring in your app in real-time. 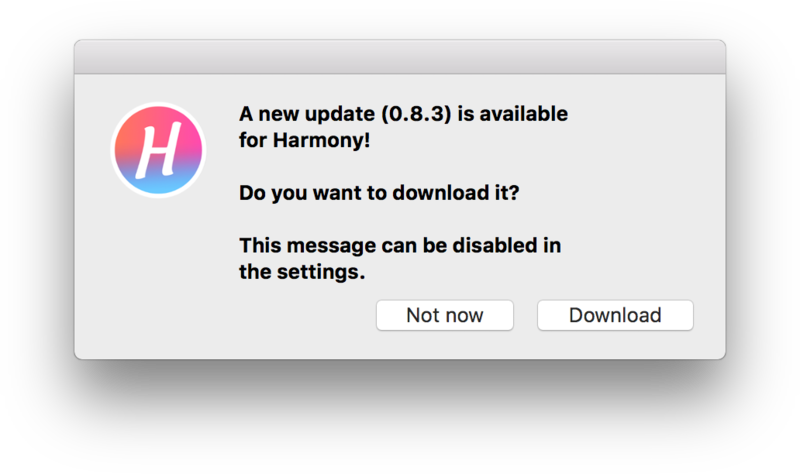 Alert your users on updates, serve a JSON file and more. As they say, you can’t improve what you don’t measure. See uncaught exceptions as they are happening, get a stack trace. Improve user experience, retention and satisfaction. Nucleus is always improving. In the beta lab, you can already try licensing (to sell your app), alert your users on new updates and send JSON data to your app. Bugs and analytics data will be captured offline and synced as soon as online. Use the NPM module to start tracking your app with only an app id. That easy. Know how many persons are using your app right now. Track actions in your app with events and remark suspicious behaviors. Detect bugs as they happen to improve your app accordingly. Track specific users and their actions through your app. If I'm not happy, can I cancel my subscription? Of course, you can cancel anytime from your dashboard if you are not satisfied. Is my data safe with Nucleus? Your password is hashed and salted using bcrypt for optimal security. Communications between your app and Nucleus are done with SSL. We don't use your data for anything else than the service and you can request anytime that all your data be deleted from our servers. We list all the data collected on this page. Nucleus was designed with Electron and desktop in mind. Include the module and it will just work. Google Analytics was created for websites thus offer a lot of useless complexy for desktop apps, requires a little hacking to work and doesn't record offline activity. Yes. Usage and bugs data are cached on the client-side while waiting for an internet connection. As soon as the client connects, data is synced. How are bugs detected and reported? You don't need to do anything, requiring the electron-nucleus module will automatically set it up. Internally, we use Node process events (uncaughtException and unhandledRejection). What happens if Nucleus go down? We strive to have the smallest down time as possible. Still, if that happens, analytics and bugs data will be cached on your user's devices and sent as soon as Nucleus is back up.